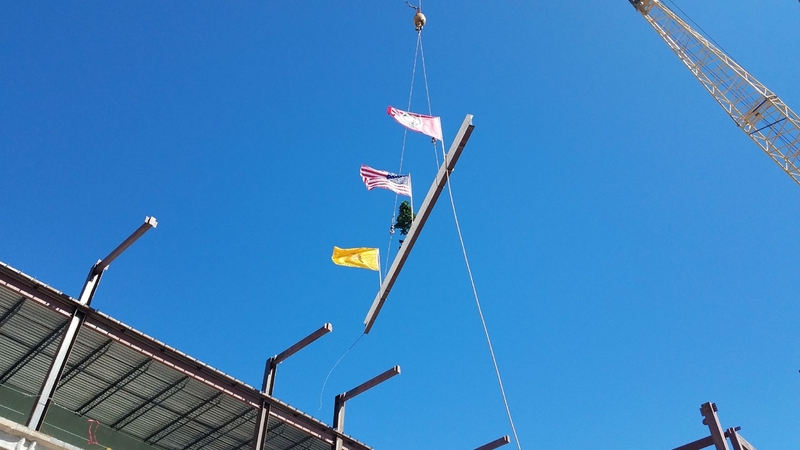 The University of New Mexico celebrated another construction milestone when officials hoisted a ceremonial beam to commemorate the completion of structural framing of the new Physics, Astronomy and Interdisciplinary Science (PAÍS) building. Presented by the College of Arts and Sciences and the Department of Physics and Astronomy, the event featured several UNM officials including President Garnett Stokes, Interim Provost Richard Wood, and Mark Peceny, dean of the College of Arts & Sciences, who welcomed attendees. Other speakers include Patricia Henning, associate vice president for Research, Wolfgang Rudolph, chair, Department of Physics and Astronomy, and Tom Turner, associate dean for Research in the College of Arts & Sciences. "The PAÍS building is one of the more historic projects at UNM. Not only is it the largest facility built on main campus, but the years of advocacy, planning and fundraising are truly quite remarkable," said Stokes. "PAÍS is unique because it is designed to facilitate collaboration. Combining knowledge, human talent and resources with a carefully designed facility, this building reflects what we know about the science of teaching, learning and research. I’m confident that PAÍS will help support our mission in attracting the best faculty, students and research opportunities to UNM. "What I want to emphasize is the impact – the impact on the fabric of our campus, and on our academic and research mission. 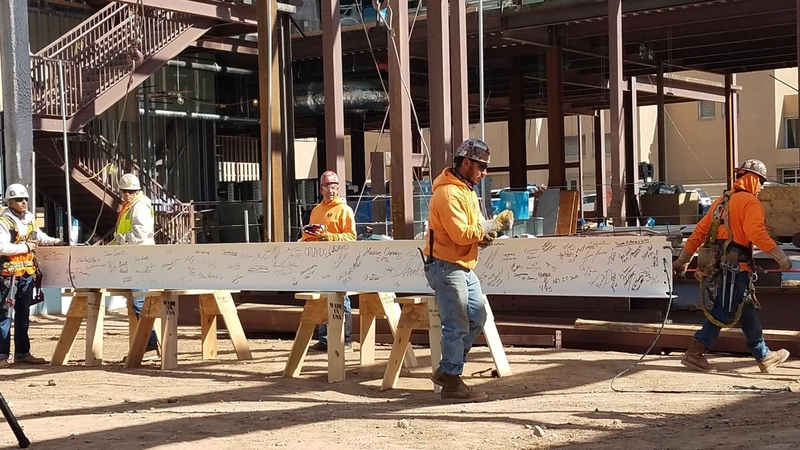 This beam will act as a time capsule for those who had a role in the development of the facility. I want to express my most sincere thanks to everyone involved in making this building a reality." When it opens in Fall 2019, PAÍS will be a state-of-the-art facility serving as a hub of innovation and research while providing space for students, faculty and staff to collaborate on many of the leading interdisciplinary issues facing the world today. Its construction was made possible by General Obligation (GO) Bond money approved by New Mexico voters in 2016. 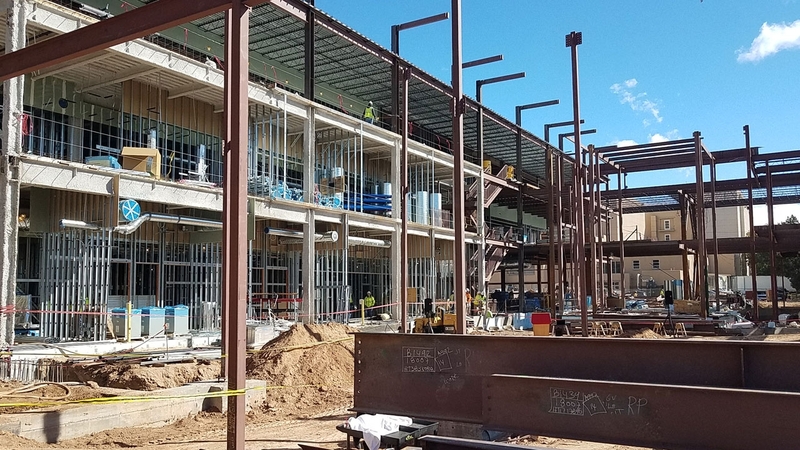 It all began years ago as a simple idea to revolutionize the way research is conducted at UNM: build a facility to house classrooms, offices and laboratory space for scientists from across campus, not just from a single department. 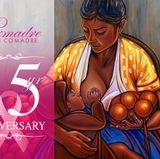 It was designed and is being built with the purpose of revolutionizing research. 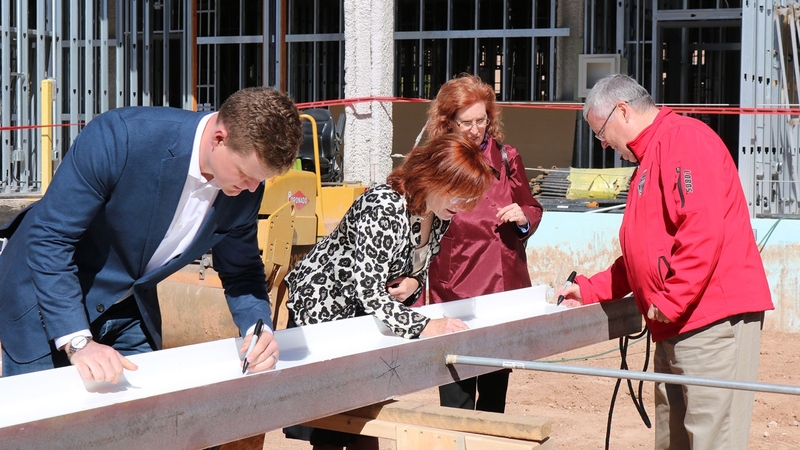 PAÍS will not only change the face of the UNM campus and provide cutting-edge facilities across the University to make the type of impact on the way students and faculty work to solve problems. It also reflects the commitment of UNM to share research and space and recognizes that UNM is both a high-powered Research I flagship university, and a federally designated Hispanic-serving institution. 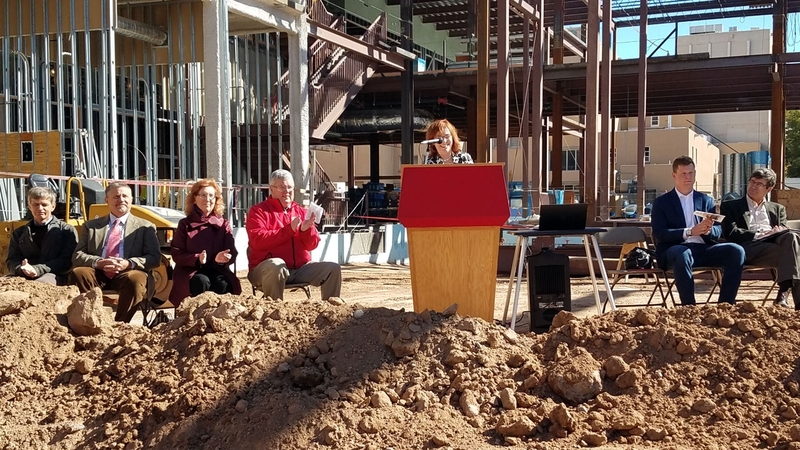 UNM officials broke ground last March on the state-of-the-art, 137,000-square-foot facility located at the southeast corner of Yale Mall where an old, dormant water reservoir for the City of Albuquerque once stood for decades. PAÍS, which is the Spanish word for country or nation, is where a variety of interdisciplinary science centers, all at the forefront of their various fields, will conduct path-breaking research. Students will work closely with faculty in a collaborative, hands-on, and interdisciplinary model of education to address questions that are beyond the reach of any single discipline. Currently, the Physics & Astronomy department is housed on North Campus, in a building constructed in 1951. Over the years, the current facility has expanded and had minor renovations and improvements, but for the caliber of research being done there, it no longer meets the basic needs of researchers and students. The move represents an interdisciplinary approach that is something many of the top research universities across the country are doing. Studies have shown these spaces can help increase conversations among researchers that can lead to innovative ideas. Also, many funding agencies are putting an emphasis on interdisciplinary research by requiring it as part of the proposals from grant writers. Research areas will involve faculty from the Arts & Sciences departments of Anthropology; Chemistry and Chemical Biology; Earth and Planetary Sciences; and Geography and Environmental Studies; as well as faculty from Engineering and Health Sciences. 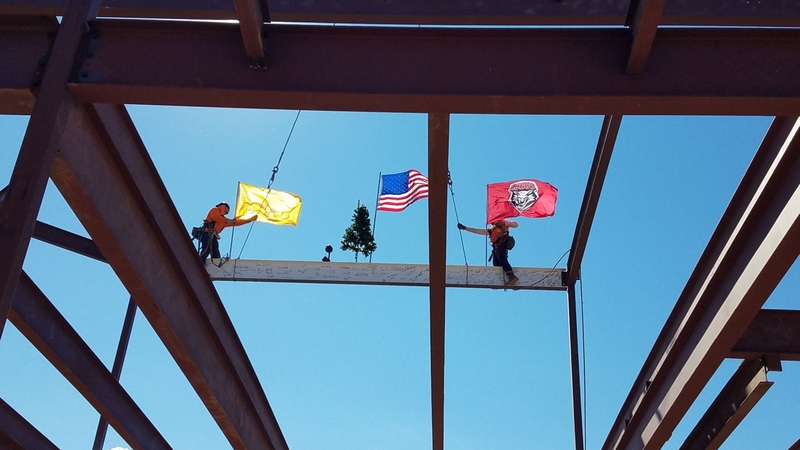 However, one of the most important benefits of the new facility will be its impact on UNM’s student population. PAÍS will give undergraduate and graduate students new classrooms and state-of-the-art laboratories in which to learn. 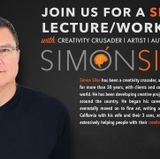 For many, the benefits to students are what make a project of this magnitude worthwhile. Other departments that will occupy the building include Chemistry, Anthropology, Biology, Earth and Planetary Sciences, and Geography and Environmental Studies. The list also includes the Center for the Advancement of Spatial Informatics Research and Education (ASPIRE), which utilizes geographic information system (GIS) mapping technology for various types of research. To help support PAÍS, visit Physics & Astronomy and Interdisciplinary Science Support Fund. For more information, visit Cross-discipline collaboration hub set to open in Fall 2019. 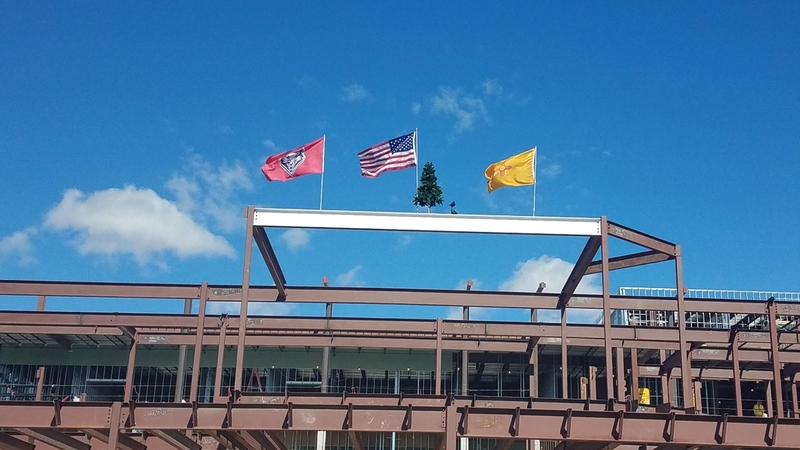 Construction is scheduled to be completed by fall 2019.